When is it ok to consume food that mold has grown on, and when should one throw the food away? That depends, in part, on the type of food. First, it’s important to understand what mold is. Mold and yeast are generally considered spoilage organisms, as they cause undesirable changes to the appearance, texture, smell, and taste of the product, explains Abigail Snyder, an assistant professor and food safety field specialist for The Ohio State University College of Food, Agricultural, and Environmental Sciences (CFAES). However, some instances of mold growth on food introduces food safety concerns, Snyder wrote in Mold Has Grown on Your Food: What Should You Do, a recent Ohioline fact sheet. Ohioline is Ohio State University Extension’s free online information resource and can be found at ohioline.osu.edu. OSU Extension is the outreach arm of CFAES. “Determining the difference between when food with mold growth should be discarded, or when the damaged portion can be removed and the rest of the food consumed, is the challenge,” she wrote. The specific food safety risk posed by mold growth varies by product. Determining the specific food safety risk associated with mold growth in a given product is essential in determining what to do with the food. In some cases, there are concerns that mold might cause allergic reactions or illness due to mycotoxin production. Generally speaking, canned food and beverages that have mold growth should be thrown out, while foods such as fermented vegetables, hard cheeses, hard meats, and firm vegetables can be eaten if you remove the molded portion of the food before consuming, Snyder wrote. For example, in the case of canned food, the issue of mold is one of food safety. Some molds will digest the acid in the canned product. This increases the pH levels of the canned food. This is important because some canned goods rely on acid to control the growth of Clostridium botulinum spores and to prevent botulism, she wrote. Mold in canned goods can also indicate incorrect heat processing, a poor vacuum, a weak seal, contamination along the jar rim, too little headspace, or under-processing of the food—all of which are potential concerns regarding the quality and safety of the product over its shelf life, Snyder said. In beverages, mold growth can lead to mycotoxin formation, which diffuses through the product. Mold growth can occur when opened juice is left too long in the refrigerator, when coffee has been left out, or in canned juices due to growth of heat-resistant molds, for example. In these cases, the beverages should be thrown out. 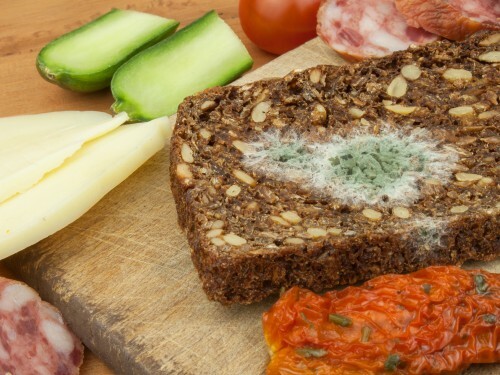 In the case of mold on hard cheeses, hard meats, and firm vegetables, generally speaking, you can remove the molded portion of the food and use the rest of the product, she said. “Some cheeses and dried meats utilize mold as part of their normal fermentation and development,” Snyder said. “As such, mold-ripened products are safe to consume. If spoilage molds are found growing on hard cheeses such as cheddar; hard meats such as dry-cured salami; and firm vegetables such as cabbage, carrots, and peppers, then the affected portion can be cut off and the rest of the product consumed, she said. Chow Line is a service of the College of Food, Agricultural, and Environmental Sciences (CFAES) and its outreach and research arms, OSU Extension and the Ohio Agricultural Research and Development Center. Send questions to Chow Line, c/o Tracy Turner, 364 W. Lane Ave., Suite B120, Columbus, OH 43201, or turner.490@osu.edu.